George Economou. Ananios. 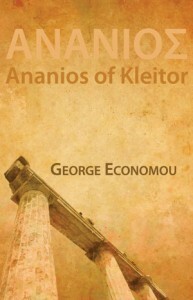 Ananios of Kleitor. Shearsman Books, 2009. Pp144. ISBN 978-1848610330. £9.95 (US $17). Ananios was born in 399 BC in the Arcadian city of Kleitor. His work is known through forty-one fragmentary poems preserved on papyrus fragments, along with twenty-five passages of verse attributed to him in quotations cited in various commentaries and literary works from the 2nd century BC to the 11th century AD. Read the review by Tim Whitmarsh from The Times Literary Supplement. Attenzione che Ananio di Kleitor non è altro che un parto della fervida fantasia letteraria del prof. Economou.